‘Once upon a time…’ many stories begin like this. You may say they are all fancy fairy tales. I say they are crazy travel tales as well! The hero or the ‘prince’ embarks on this crazy journey to save his ‘princess’. Wandering through dense forests, lying beneath starlit skies, and sailing across mighty oceans, he rescues his beloved through high mountain passes. We are taught to decipher the hidden meanings and messages of love and life in these stories. Well, many of us did actually, that’s probably why half of the girls are waiting for their prince charming and most of us guys are in search of our princesses! But what I learnt from these stories is that there’s this huge world out there waiting to greet us, for us to see and explore! Yeah, I know, even this sounds like a fantasy, but anyhow the point is, they are crazy travel stories! But unfortunately, I was never a prince charming and there were no princesses waiting for me, so my travel dreams were like.. just dreams. Until, this crazy friend of mine took me to this road trip that changed me completely. A trip to a mystical lake amidst the mountains of Himalayas – Trip to Deoria Tal. I know I use the word crazy a lot, but that’s how my life always has been, and this road trip was an epitome of craziness. When you’re planning to go on a trip, you plan everything a few days in advance, right? I thought the same but, I forgot I was relying on this unpredictable person, completely. Okay, I guess I should give a brief introduction of this trip. So we were going to visit this lake, Deoria Tal (also spelt as Devariya Tal), in some obscure part of Uttarakhand and will camp next to it. 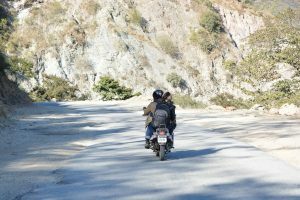 The journey would begin from Rishikesh, where we’ll be renting bikes and will travel all the way to the lake, and embark our road journey via Devprayag, Srinagar, Rudraprayag, Ukhimath, Sari Village and finally a 2 km trek to Deoria Tal. A fun fact – this lake, Deoria Tal, has its roots in our Hindu mythology, in the story of Mahabharata, in which the Pandavas visit this lake to drink water and a Yaksha (a mythical being or deity who protects nature) emerged from the lake and asked Pandavas few questions. If they’ll be able to answer his questions correctly, he’ll allow them to drink water, else they’ll die. Only Yudhisthira, the eldest Pandava, was able to answer all the questions and was able to save his brothers as well. 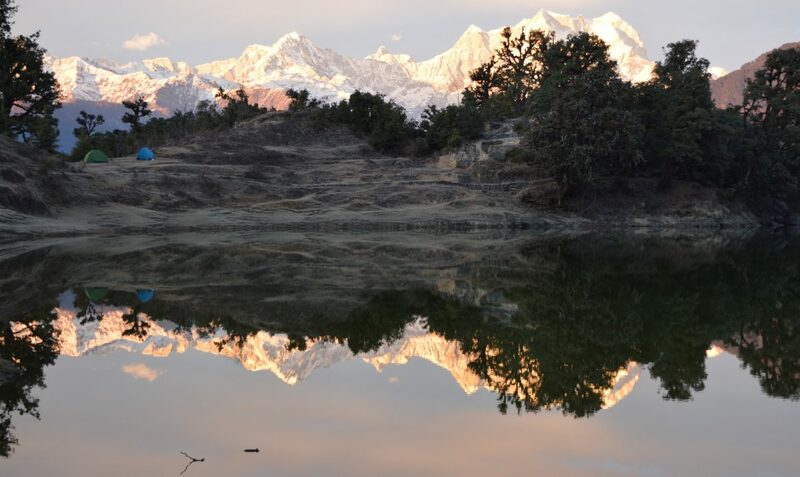 Deoria Tal, or Devariya Tal, also means the lake of the Gods. It was believed to be a sacred lake where Devas, Gods, used to bath. Yeah! So coming back to the story, the whole trip and everything should have been pre-planned. But unfortunately, nothing was planned till the time I reached Rishikesh on the day of our journey. Yeah! It was wonderful. You know right, how this works? When you ask people for a trip, everyone is up for it, but when you start planning, few people back out. Later when you are actually going on the trip, it’s just you alone! Well, my parents would have been very happy with their ‘all-knowing’ evil smile. But, I couldn’t go back now, I wanted a vacation! She said she’ll come to Rishikesh anyway to see me, and we’ll just wander over there. So with a heavy heart, I took my seat and thought, maybe my fairy travel tale would take some more time to be published. However, the unexpected ‘crazy’ road trip actually started with that bus ride only. 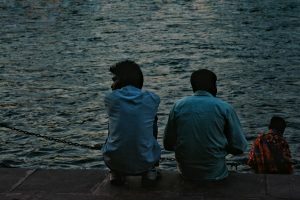 I was sitting in the corner seat of the last row of the bus, where it gets very bumpy when I met these two brothers who too were looking for a getaway from this monotonous cacophony of city life. I used to be quite shy at that time to start a conversation, but thanks to those chitter-chatter girls who were sitting 2 rows ahead of us, we got a common topic to talk, to mock someone. Our bus reached Rishikesh early at 5am and had 3 more hours to kill before my friend arrives, so those two brothers asked me if I’d like to join them for a walk to a ghat nearby. A ghat is a flight of steps that leads you down the river. First thought that crossed my mind was of my mother saying “Stay away from strangers! Don’t talk to them!” But, wasn’t I there to explore and experience new adventures? So I went with them, and found out they were really cool travellers themselves! They were from Assam and were working in NCR. We sang songs of Papon all the way, they tolerated me when I used to stop midway to take few pictures, and we drank tea from a roadside stall. We attended Aarti and lit floating Diyas in the river Ganga. After 3 hours of wandering the streets of Rishikesh, I contacted my friend who asked me to meet her at Laxman Jhulla, where she was waiting with, unexpectedly, 4 more people. I exchanged greetings with them, 4 guys with their non-studious IITian looks (No! I’m not being judgemental, I just analyse people), and found out they were equally enthusiastic and adventure driven people as my friend (or maybe, all IITians are like that?). Anyhow, I was certain by now that it’s going to be a heck of a trip. We rented 3 bikes, Royal Enfield, and embarked on our journey to this lake residing in the laps of Himalayas. We crossed Devprayag (here two rivers Alaknanda and Bhagirathi meet, to take the form of mighty Ganga), we halted at Srinagar, a small city on the way and the only one with some good options to eat, and reached Rudraprayag at night. Rudraprayag is a town and municipality in Rudraprayag district and is the point of confluence of rivers Alaknanda and Mandakini. We hit the sack for the night at one of the guest houses (very cheap, Rs. 200 per person) and were back on the road early in the morning. We had breakfast (tea and Maggi) on a roadside tea stall and reached Ukhimath, our last checkpoint before reaching our destination. Here we filled the tank of our bikes and after getting off from our track and losing some time, we reached Sari Village, a small hamlet on the upper Garhwal region of Uttrakhand. We parked our bikes next to a small shop, owned by a very benevolent and generous elderly person. He quenched our hunger with his delicious Aloo Paratha and Maggi and showed us a way to the lake. It was a 2 km trek up the hill and the whole view of Himalayas was mesmerising. When we reached on top, the site that greeted us, was breathtaking! There in the middle of the meadow was this huge lake, enchanting, and it seriously had that aura of being very spiritual and mysteriously magical. Here it was, the lake of the Gods, Deoria Tal! 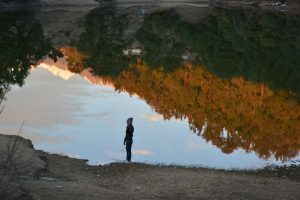 It is so clean and pure, you can see the complete reflection of the mountains and sky on its surface. It really seemed like heaven on Earth! Not that I’ve ever seen or been to heaven, but you know what I mean, right? We purchased a tent from the caretaker of the lake and camped next to the lake. I was so enchanted by the lake that I put down my camera and was just staring into its depth if I could decipher its mystery, or a Yaksha will emerge and test my knowledge maybe? We lit a campfire, danced, sang, played games in dark, were abused by other backpackers for making too much noise, and enjoyed every bit of time. I expected to see a lot of stars at night, but alas! It was a bit cloudy. But as the next day dawn on us, it brought a new surprise to add to our trip. We exited our tent early in the morning to find the whole meadow whitewashed by those tiny snowflakes drizzling from the sky. 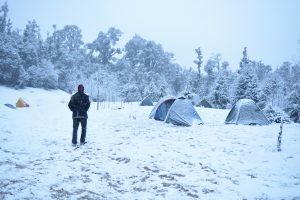 “It snowed whole night and early morning.” said one of the other travellers. It was amazing, like a dream come true. I had never witnessed a snowfall before. We made a snowman, used a dustbin lid as a sledge to slide down the snow-laden peaks, and lost a few of our accessories in the excitement. People say winter signifies stillness, silence, even death. To me, it symbolises beauty. Winter is not merely solitude but a quest to seek within. 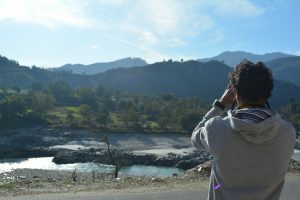 A couple of games, some photoshoots, and a few cups of tea later, we descended to the village and started on our way back to Rishikesh. It had started raining but that didn’t stop us. We purchased a few raincoat wind cheaters and hit the road. We reached Rishikesh the same night, and I took a bus back to NCR. I had never imagined that it would turn out to be such a great and adventurous trip, that I would meet such amazing people, and will ever be able to find such serenity in India. Well, I must say, my first road trip was literally ‘supercalifragilisticexpialidocious’. I mean, extremely awesome!